"This is quick, easy, and it's really great when it's cold outside. Stay in the kitchen and let the oven keep you warm as you cook. Serve with a salad...easy and delicious!" Place the potatoes in a 10x15 inch baking dish and arrange the pork chops over the potatoes. Prepare the onion soup mix according to package directions and pour this over the pork and potatoes. Bake at 400 degrees F (200 degrees C) for 30 to 40 minutes, or until potatoes are tender and the internal temperature of the pork reaches 145 degrees F (63 degrees C). Very good and easy. Next time I will try just 3 cups of water with the soup mix though. I did have to remove the chops and cook the potatoes about 15 minutes longer. 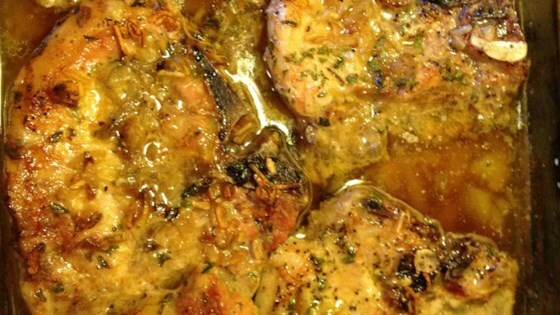 We love pork chops, potatoes and onion soup, but this recipe was just OK. The leftovers are in the freezer... and we aren't in any rush to take them out. This was really good and the pork chops were so tender!